The Manchester Grammar School (MGS) was founded in 1515 by Hugh Oldham, Bishop of Exeter, to provide ‘godliness and good learning’ to the poor boys of Manchester. The school proceeded to build a reputation as one of the country’s leading educational establishments, a position it still holds today. Sport is at the beating heart of this prestigious educational centre of excellence with their new sports hall providing a facility second to none. The previous sports hall was damaged during severe weather in 2014 and in its place a new two-storey facility has been built. The solution supplied by international flooring and interiors specialist Gerflor for this new sports area was pivotal in furnishing a high-quality sports solution that provides comfort, safety and a high degree of performance. Stockport-based Architects WAJW, after many meetings with the school, specified some 1,250m2 of Gerflor’s Taraflex® Comfort and Performance in Lagoon and Oak colours for the main hall and upstairs junior hall areas. The process of selection entailed a number of Taraflex® samples being laid to highlight the product’s enormous comfort and safety qualities. After a visit by Gerflor’s UK Technical Manager, Nicholas Egan, the die was cast. 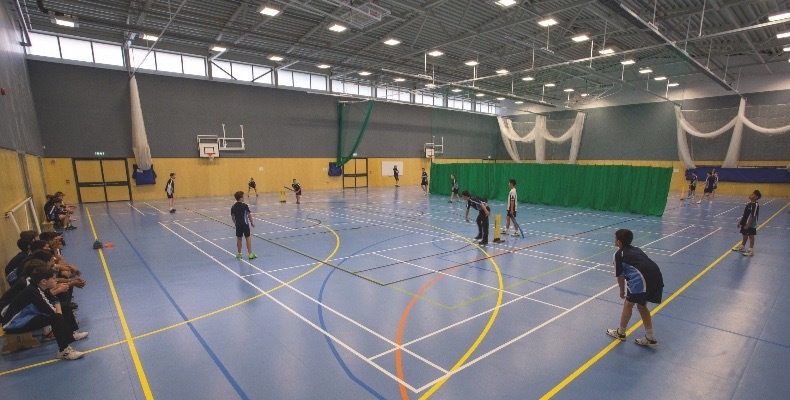 Taraflex® Comfort was the preferred flooring solution as it also provided a flooring that would not need an extra matting layer, enabling cricket to be played directly on the Taraflex® surface. The fitting of this top-end performing sports flooring fell to Premier Flooring Solutions Ltd. Established in January 2008, Premier Flooring Solutions Ltd are an independent company based in Swinton, Greater Manchester. Since trading they have gained relationships with a number of clients primarily in the retail shop-fitting refurbishment sector and the construction industry. They take great pride in the quality of their workmanship with their staff being trained to highest standards. Taraflex® from Gerflor has been used in many international and local sporting events and is available in 17 colours and two wood-effect designs. In fact, Taraflex® made a real difference at the Rio Olympic Games as the chosen flooring for the handball and volleyball courts. The Comfort product supplied to Manchester Grammar is in the P2/P3 category meaning fewer bumps, bruises and friction burns for the students and users. In fact, it provides three times the standard abrasion resistance required. It also meets the EN 14904 Standard for indoor sports surfaces and is ECB compliant. Taraflex® is recognised for providing durability, safety and comfort without impairing performance. The range offers greater than 45% force reduction, making it unrivalled in the marketplace in terms of offering comfort for users. In 2015 former cricket international Mike Atherton OBE returned to his old school, Manchester Grammar, when he opened the new sports hall. Taraflex® also meets the EN Standard of 22196 for anti-bacterial activity (E. coli – S. aureus – MRSA) (3) returning >99% levels of growth inhibition. The product is treated with Protecsol®, which renders polish redundant and is triple-action meaning no polish is ever required, it contributes to easy maintenance and is anti-friction burn and slide/grip. Taraflex® has a double density foam backing and as another bonus, it’s environmentally friendly. Gerflor offers a number of installation solutions for Taraflex® including the Eco-Fit System which allows for a fast track, free floating installation. Taraflex® is versatile enough to be used in various multi-specialist applications and affordable for all new projects and refurbishments. This sports flooring solution is used within the education, community, leisure, health and fitness sectors. Learn more about Gerflor solutions, ask for a free sample or speak to a specialist by calling 01926 622 600, emailing contractuk@gerflor.com or visiting gerflor.co.uk for the latest innovations.